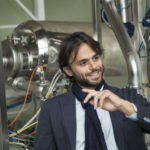 Giampaolo Betta is a Mechanical Engineer and PhD in Food Science and Technology, formerly contracted Professor at the University of Parma. With over ten years experience in hygienic design and engineering of food equipment, he works as a consultant for the food, pharma and cosmetic industry, food equipment manufacturers and the other suppliers of the food industry. He is the Chairman of the Italian Section of the European Hygienic Engineering and Design Group (EHEDG) and EHEDG Authorized Trainer.